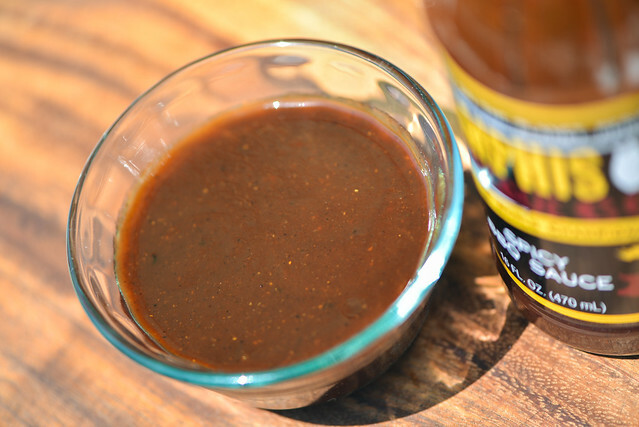 A smoky, earthy spice defines this sauce, whose immense heat strikes a nice balance with sweetness after being grilled. This sauce comes courtesy of Memphis Barbecue Co. by way of my barbecue buddy Clint of Smoke in Da Eye. Memphis Barbecue Co. is helmed by award-winning pitmaster Melissa Cookston from the competition team Yazoo's Delta Q. She opened her first restaurant in 2011 just south of Memphis in Horn Lake, Mississippi. Since then, she's expanded to two more locations in Fayetteville, NC and Dunwoody, GA. 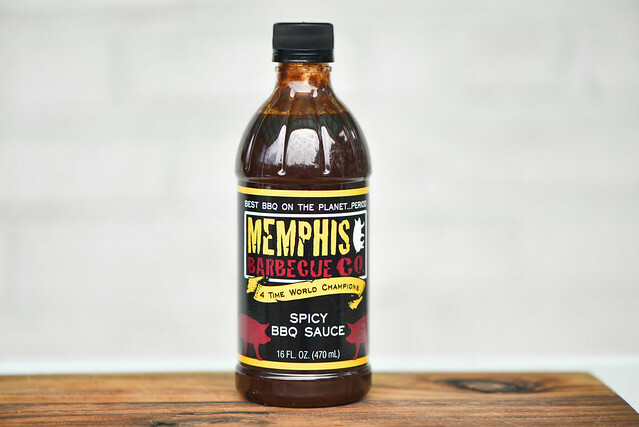 Beyond the 'cue she's slinging at these far flung outposts, Memphis Barbecue Co. also produces various apparel, two barbecue sauces, one rub, and a cookbook, Smokin' in the Boys Room. A deep and tangy aroma fills the nose on first whiff with the distinct combination of vinegar and molasses. Behind the wall of molasses, the sweetness of tomato ketchup is muddled by an earthy heat that's just enough to give the nose a little burn. A mellow smokiness melds seamlessly with the sugar and spice to create a well balanced, robust ubiquitous barbecue profile. This smooth, dark maroon sauce runs just slightly below medium on the thickness scale. It falls from a spoon in quick, syrupy pour whose evenness is sometimes broken up by a small bit of veggie here and there. As the sauce slows, a few final drips release from the spoon and a light coating is left clinging. Despite being opaque, a ton of spices can easily be seen peppered throughout. The sauce starts with a strong molasses flavor that gains a tomato fruitiness as ketchup begins to mix in. A sweetness can be tasted at this point, but it's quickly beaten back by tart vinegar at first, then completely taken over by a wave of heat. The heat is produced by a variety of spices that create an earthy depth to the fire that builds in the mouth as the sauce begins to leave the tongue. At the same time the heat begins its dominance, a smoky undertone comes into play and sticks around, becoming part of the final hot, tangy, and smoky aftertaste. The sauce coated the chicken in a nice, even layer. It baked down well over indirect heat, then continued to cling over direct heat, where it picked up attractive caramelization without any burning. The flavor still leaned heavily towards molasses, which was made more prominent by the amped up sweetness and more mellow heat. The defining spice remained though, but came into a better balance with the sweetness that resulted in a final flavor I enjoyed better than out of the jar. Some additional ingredients the heat was previously covering up came out as well, the most notable being onion and Worcestershire. I love a nice spicy sauce, and this one had a lot of good going on. Unfortunately, directly out of the jar, the immense heat came on too quickly and covered up the sweetness and some extra components that were brought out after being cooked. Still, the heat in both instances wasn't just hot for hot's sake—it was layered with different peppers that gave the sauce both a spicy and earthy quality. 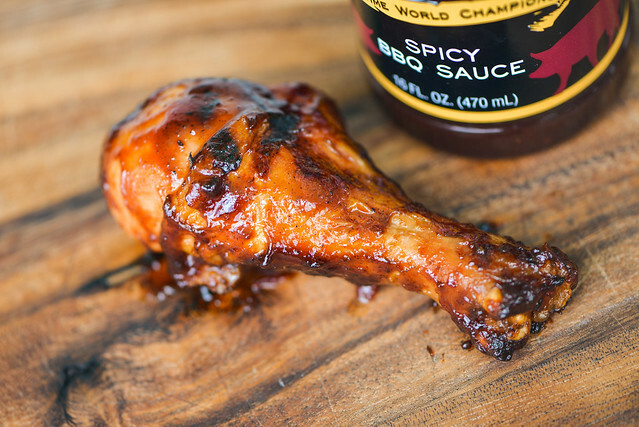 It's a mixture that I think would go a long way on a set of crispy grilled wings, but would also be great on a rack of ribs or standard barbecue chicken.